Poland hosts the Warsaw Cup, the eighth of the 10 Challenger Series events, Nov. 17-19. Italy’s Valentina Marchei and Ondřej Hotárek are slated to compete and Courtney Hicks of the U.S. will go up against a young field, including two Russian junior stars. 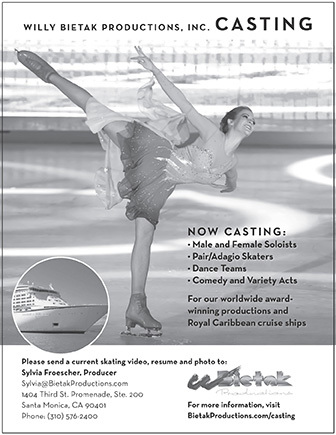 In total, 20 men, 21 ladies, eight pairs and 14 ice dance teams are slated to compete. Canada’s Elladj Balde has withdrawn. He is performing on Evgeni Plushenko’s European tour next week. The ISU Challenger Series is an International Figure Skating Series, introduced during the 2014/15 season. Through ISU support, the objective is to ensure the proper and consistent organization and conduct of up to ten (10) International Competitions linked together within the ISU Challenger Series. The Series gives adequate opportunities for many Skaters to compete at the international senior level and earn World Standing Points. The Series also increases the opportunity for Officials to officiate at an international level. To be considered for the Challenger Series, the competition must have at least three disciplines and a minimum of entries per discipline. The ISU Council reiterates that being mindful that the ISU support towards the ISU Grand Prix of Figure Skating is restricted to a limited group of organizing ISU Members, to a limited number of Skaters and to a limited number of Officials, the ISU Council agreed to financially support a restricted group of identified ISU Members traditionally staging International Figure Skating Competitions being part of the ISU Event Calendar. This ISU support has the objective to ensure the proper and consistent organization and conduct of up to ten (10) International Competitions linked together within the ISU Challenger Series in Figure Skating giving adequate opportunities for many Skaters to compete at the international senior level and earn World Standing Points and to increase the opportunity for Officials to officiate at an international level.